Springbok rugby is a national happening in South Africa. 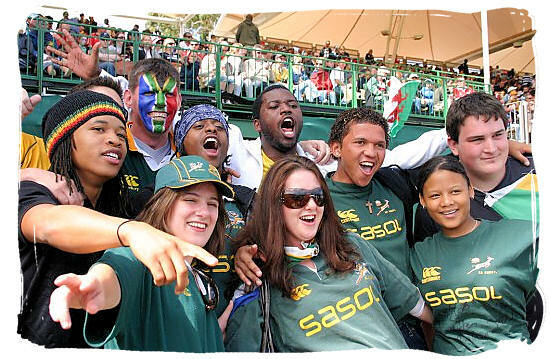 Laughing, crying, cheering and shouting in frenzy, that is how South Africans of all races love to give air to their passion and emotions when they watch their national Springbok rugby team play. 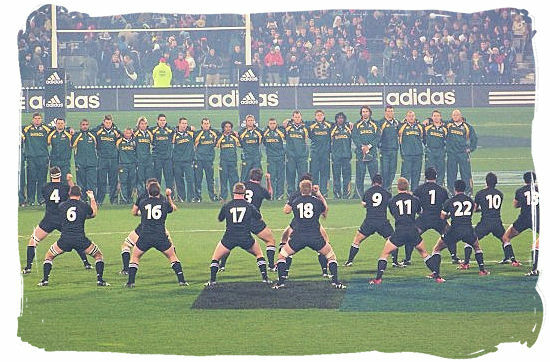 All barriers come down because their national honour and pride is at stake, even for those that normally do not care all that much for the sport of rugby. And so the Springbok national rugby team of South Africa has played and is playing a major role in the unification of its people. Currently South Africa is home to the World Cup, the World Sevens Series, the Super 14 Trophy and they also won the 2009 three test series against the British Lions.So, yes indeed we are a proud rugby playing nation and to win from us really takes some doing. 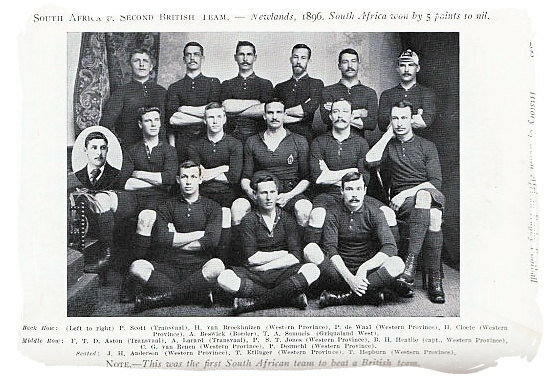 Historically the term 'Springbok' was applied to any team or individual representing South Africa in international competition regardless of sporting discipline. This tradition was abandoned with the advent of South Africa's new democratic government in 1994. 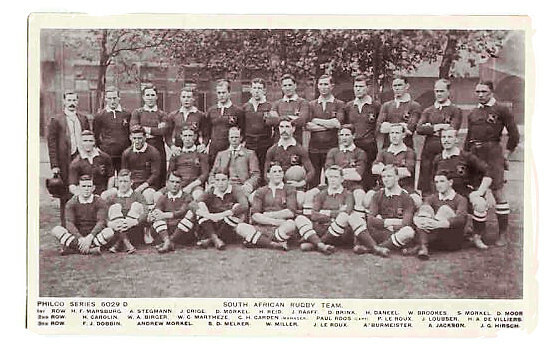 While the national rugby team was allowed to keep on carrying the name “Springboks” and wearing the springbok emblem on their jersey, the “Protea” (South Africa’s national flower) was introduced as the name and emblem for the national teams of other sport types, such as Cricket and Soccer. Currently the Springboks are playing in green jerseys with a gold collar, white shorts and green socks. The jersey is embroidered with the springbok emblem on the upper right side of the jersey and the Protea emblem on the upper left side. It also has the South African flag embroidered on the left sleeve. The Springboks have an outstanding international score sheet, and for many years enjoyed a winning record against all other nations, until a slight slump in performances after South Africa's return from international isolation in 1992. 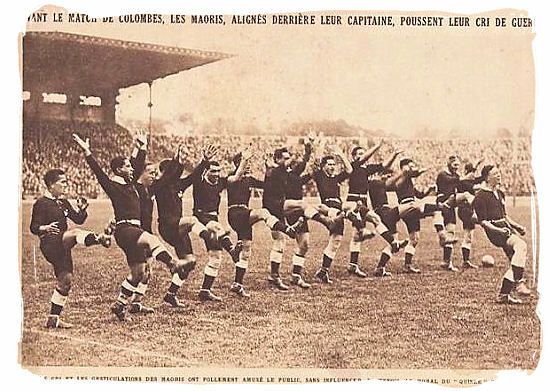 In between World War I and World War II New Zealand and South Africa had established themselves as rugby's two greatest powers. 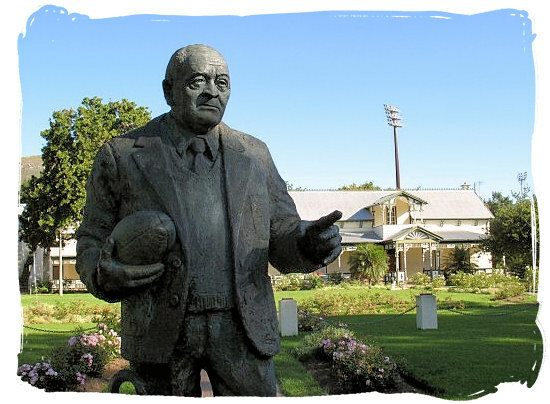 In 1949 another South African rugby Icon appeared on the scene when Danie Craven was appointed coach of the Springbok team. He started his career with a bang, with the Springboks winning ten matches in a row, including a 4 - 0 whitewash of New Zealand on their 1949 tour to South Africa. 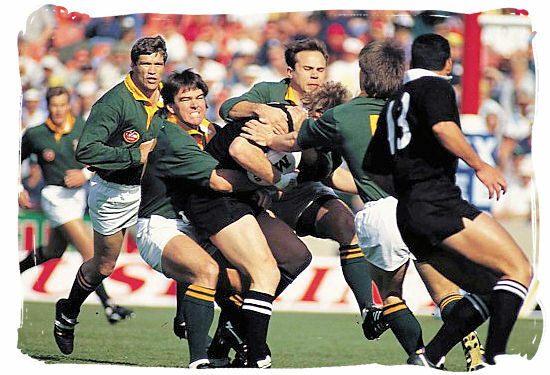 Until the 1990's South Africa was easily the most successful rugby nation in Test match history, with a positive win-loss ratio against every Test playing nation including their traditional rivals, the New Zealand "All Blacks". Despite having to contend with off field problems that the other major Test nations did not face, the Springboks still maintained their positive win-loss ratio against every team, other than New Zealand. 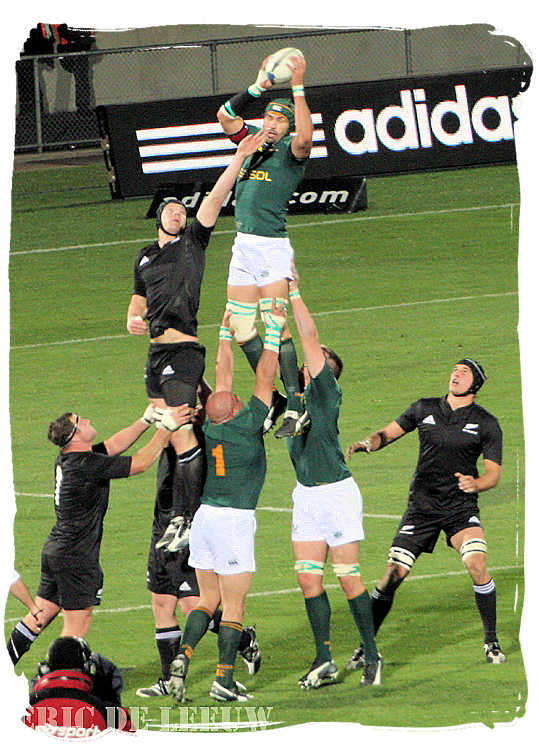 The All Blacks eventually managed to overtake a dominant South Africa because of a string of Springbok losses caused by the lack of a reliable goal kicker. 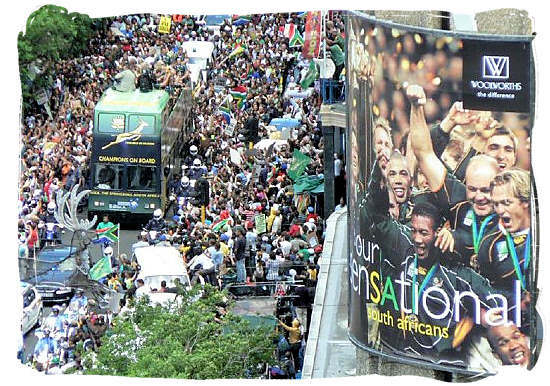 Because of South Africa’s Apartheid policy, the Commonwealth members signed the Gleneagles Agreement in 1977, a punitive measure which discouraged the international community to have any sporting contacts with South Africa. From 1990 to 1991 the legal apparatus of apartheid was abolished, and the Springboks were readmitted to international rugby in 1992. 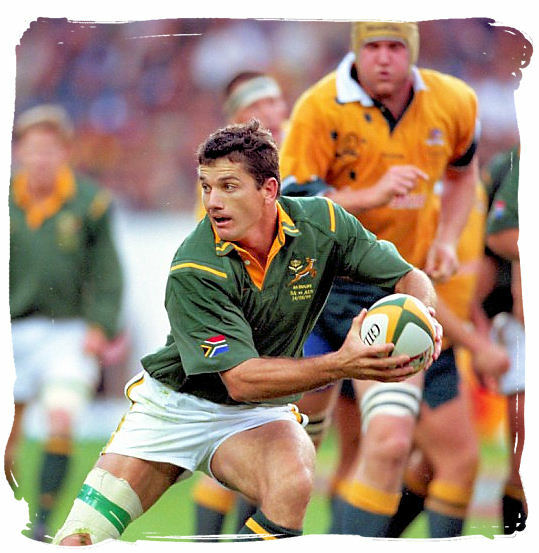 South African rugby has grown from strength to strength since the readmission onto the international arena in 1991 and our players have been racking-in the top international rugby honours. In 2004 Schalk Burger became the first South African rugby player to win all of rugby’s top international awards. There have been four big highlights since South Africa's return from international isolation. The first of these took place in 1995 when the country hosted rugby's biggest tournament, the World Cup. The Springboks made it through to the final at Ellis Park where, spurred on by a frenzied home crowd, and with the whole of South Africa willing them on, they trumped the All Blacks 15-12 in extra time to lift the sport's most coveted trophy. 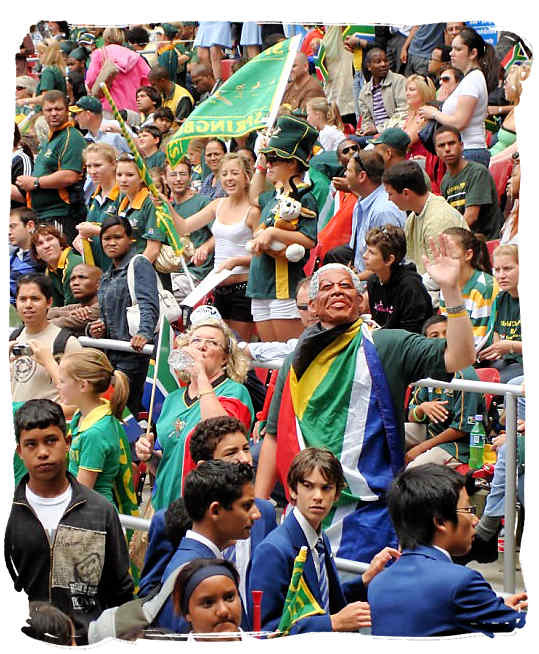 The Bok’s display, opening with a win over defending champions Australia and finishing with victory over favourites New Zealand, united the country, bringing people of all colours together just a year after South Africa's first democratic elections. 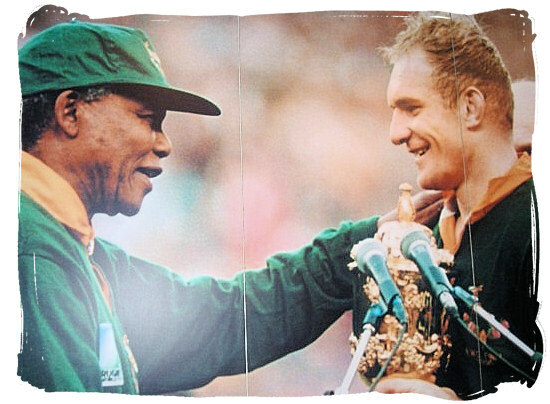 The picture of the Springbok captain Francois Pienaar hoisting the famous World Cup, the William Webb Ellis Trophy, together with Nelson Mandela who was our first president at the time, remains one of the country’s proudest moments on the road to peaceful unification of its people. The second highlight occurred in 1998, when South Africa broke New Zealand's hold on the Tri-Nations, a competition that matches up the "big three" of the southern hemisphere, with Australia completing the trio. The Kiwis had won the first two competitions without losing a match, but Gary Teichmann's 1998 side showed spirit and poise in winning all four of their matches to lift the title for the first time. The third highlight included the Springboks' 1998 Tri-Nations title and went beyond it. It was a run of 17 victories in succession, equaling the world record run by New Zealand between 1965 and 1970 (which, appropriately, was halted by South Africa). 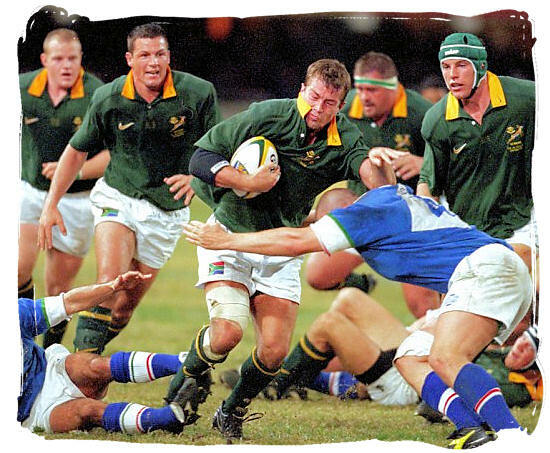 During their 1997/98 run, South Africa defeated Australia, New Zealand, France, England, Scotland, Ireland, Wales and Italy - all of them, with the exception of Italy, teams rated amongst the world's elite. 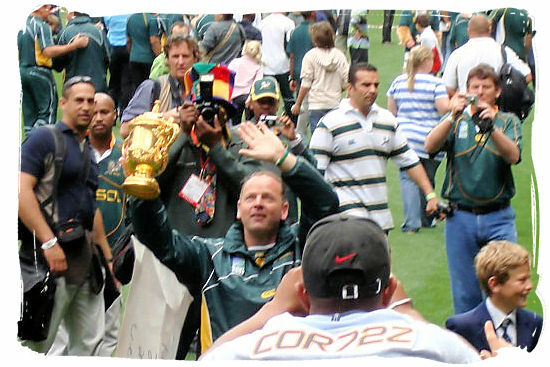 After a rough period, during which Springbok coaches came and went with alarming rapidity, Jake White was appointed coach in 2003. He would go on to lead the team in more matches than any other Springbok coach. He was also at the helm when the fourth great highlight was achieved. That was in October 2007, when South Africa beat England 15-6 in the final of the World Cup in Paris, after advancing through the tournament unbeaten, to join Australia as the only two-time winner of the William Webb Ellis Trophy. Not long afterwards, Jake White was named International Rugby Board (IRB) Coach of the Year and Bryan Habana IRB Player of the Year. 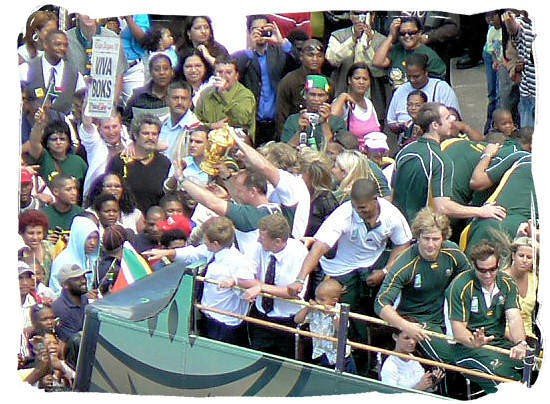 The Springboks were named IRB Team of the Year and, at the Laureus Sports Awards in February 2008, World Sports Team of the Year.